Hey friends! 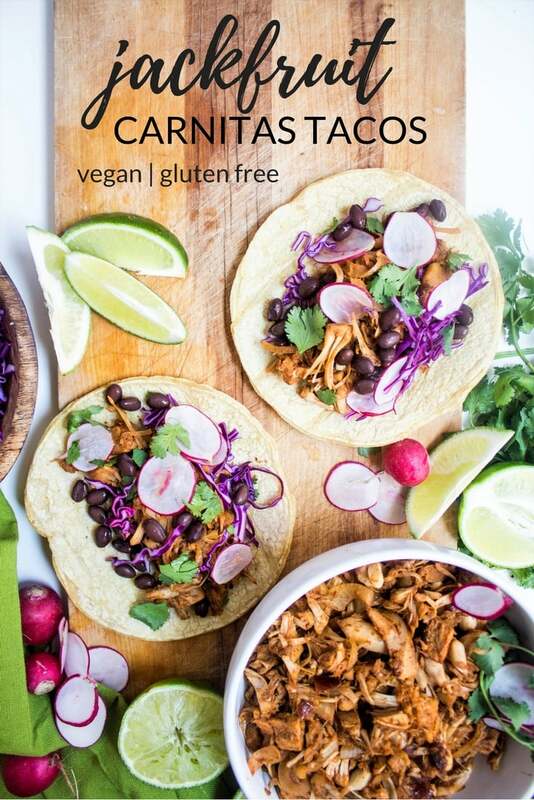 I’m excited to share this fun new recipe with you: Jackfruit Carnitas. I’m always looking for meatless meals to share for vegetarian and vegan readers and this recipe fits the bill! 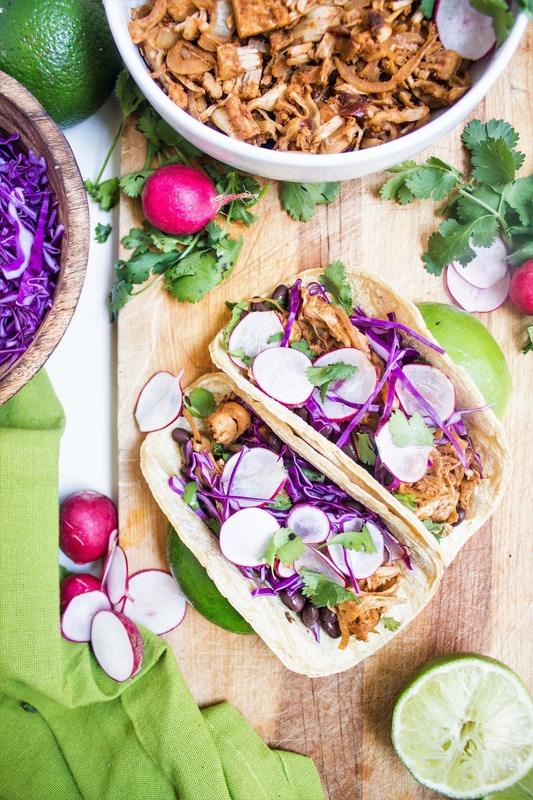 It looks – and tastes – surprisingly like pork carnitas, but it’s vegan and quick enough to make on any weeknight (Taco Tuesday, anyone?)! 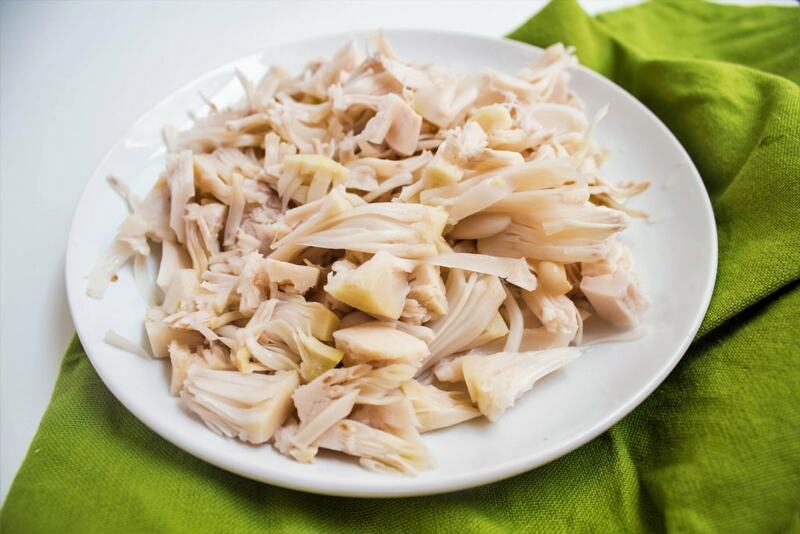 You will typically find two types of canned jackfruit – jackfruit in brine/water and jackfruit in syrup. For this recipe, you want jackfruit in brine/water – it’s typically just jackfruit, water, and salt. Jackfruit in syrup is a more ripened jackfruit, with sugar added, making its texture more similar to a banana than meat. You can find canned jackfruit on Amazon, or in an Asian specialty store alongside the canned water chestnuts, mushrooms, and the like. Your regular grocery store may carry it now, too, since it’s gaining popularity. Doesn’t hurt to call and ask! 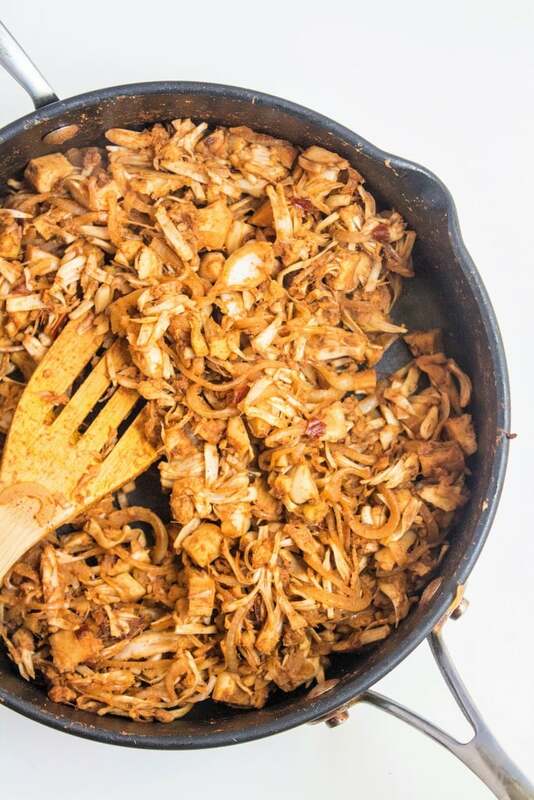 Start by shredding your jackfruit – it should pull apart into tender pieces pretty easily. Any parts that look like seeds are totally fine to keep in there, too. The texture doesn’t turn out any differently once it’s all cooked! Next, it’s as simple as sauteing onions and adding in the jackfruit & seasonings. Fast and easy – on the table in minutes is how I like to roll. 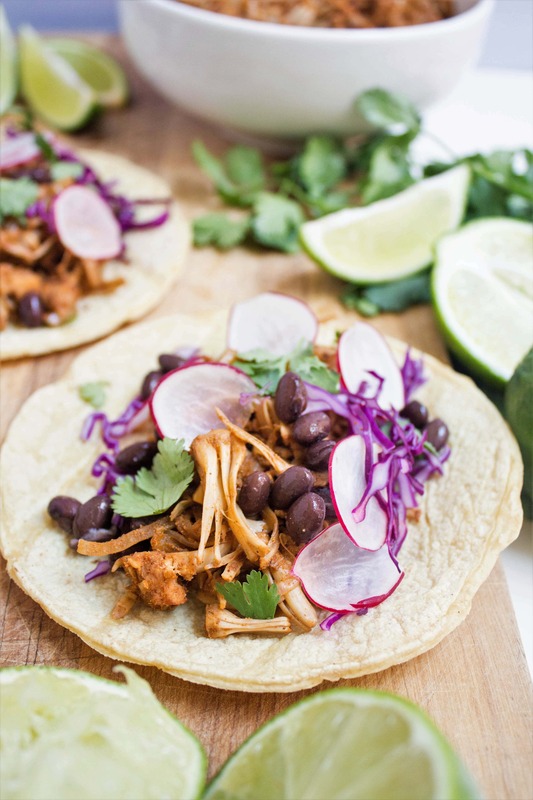 As far as nutrition goes, jackfruit lacks the protein that meat has, even though it’s got the meaty chew and texture, so I suggest adding some beans to the mix in these tacos to amp up the staying power. Jackfruit is high in potassium, vitamin C, vitamin B6, magnesium, and fiber, though! 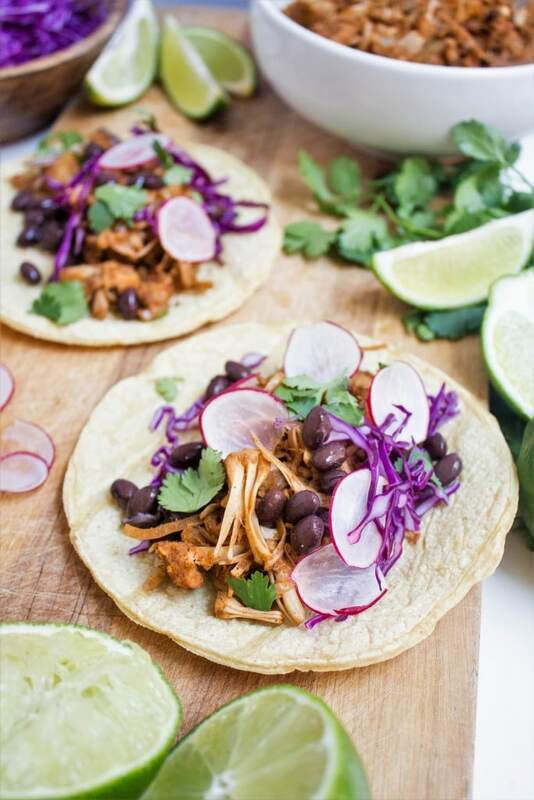 for serving: tortillas, beans, cabbage, radishes, cilantro, limes, whatever taco toppings you love! Heat a drizzle of olive oil in a large skillet over medium-high heat. 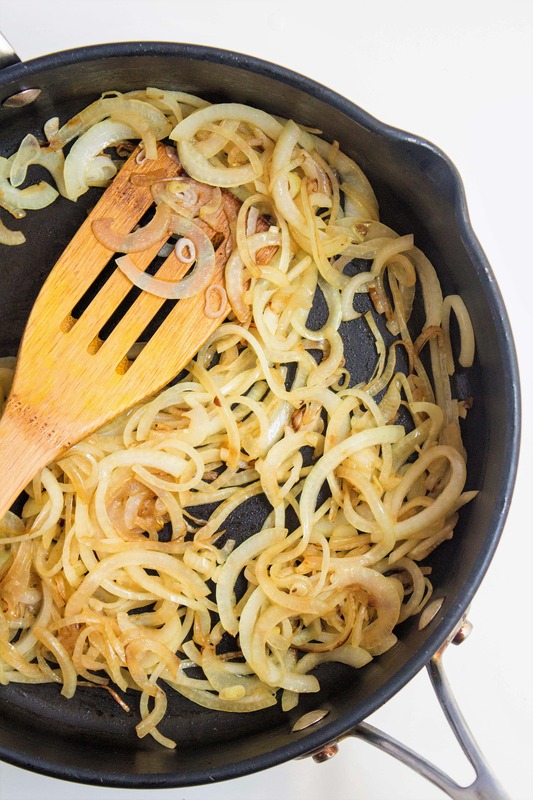 Add the thinly sliced onion and saute for 4-5 minutes, until softened and lightly caramelized. Meanwhile, shred the jackfruit (if yours doesn’t come already shredded) – it should pull apart easily into shreds that look like pulled chicken. If there are any round knobby pieces in there, or any of the core that doesn’t shred the same way, they’re totally fine. The texture and flavor are no different, and you won’t notice them once everything’s cooked. Add the jackfruit, cumin, chili powder, paprika, garlic powder, and chipolte peppers to the pan. Stir to evenly distribute the spices and cook for another 4-5 minutes, until the jackfruit is slightly crisped on the edges. Season with salt, to taste. 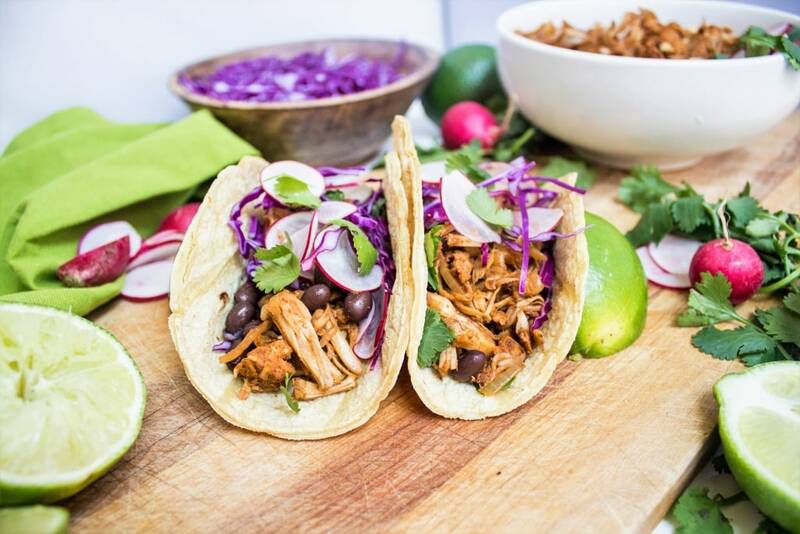 Serve with all your favorite taco toppings – make sure to include some beans in your tacos for protein; even though jackfruit looks a lot like meat, it only has a tiny bit of protein! If you liked this recipe, check out some of my other favorite vegan and vegetarian dinner ideas! Have you ever eaten jackfruit or cooked with it? Let me know in the comments below! I’ve never tried jackfruit before, but these tacos look delicious! Wow, what a great idea! Will definitely have to try that. I’ve been seeing jackfruit pop up on food trend lists for a while now, and just spotted a can of jackfruit in brine at Trader Joe’s this week. Thanks for giving me a reason to try it! I’ve never tried jackfruit, but just noticed it at the grocery store the other day…Now I’ll know what to do with it! These look so bright and pretty with the radish and cabbage. Never heard of it; thanks for the education! I will have to search out canned jackfruit. I’ve been wanting to try pulled jackfruit so badly since I stopped eating meat (pulled pork was a favorite!). I went to make these once, but all I could find were fresh, which are HUGE – and around $40! I’m so glad to see this recipe! I have been seeing jackfruit more and more in my local stores, but was scared to try it. This looks great though! I love this idea! I recently got a jackfruit for the first time and 1. had no idea how to eat it and 2. had no idea how to cut it. I didn’t know it came canned—I’ll have to look out for that! I DEFINITELY want to get my hands on some jackfruit! It’s something I’ve never really looked for, so hoping my grocery store has it! Ok Anne if you are in Melbourne then you need to visit Mamasita and Fonda as they are some of the best Mexican places. Oh and you need to visit South Melbourne and the markets on a Wednesday. This looks so good! Never heard of jackfruit before, but I love trying new foods. this is a really creative recipe! I wish I could fix that for you (I agree, that would be nice!) but unfortunately that’s a bit beyond my technical skills. :( I’m sorry. Thank you for reading! I tried a pre-marinated BBQ jackfruit before and found it too sweet and found the seeds in it caused a gross texture. I’ve never tried the canned variety…maybe it would be less sweet! Thanks for sharing this–I’m always up to try a new vegan recipe! Definitely try it this way! Starting with the jackfruit canned in water is nice because you add any sweetness yourself! 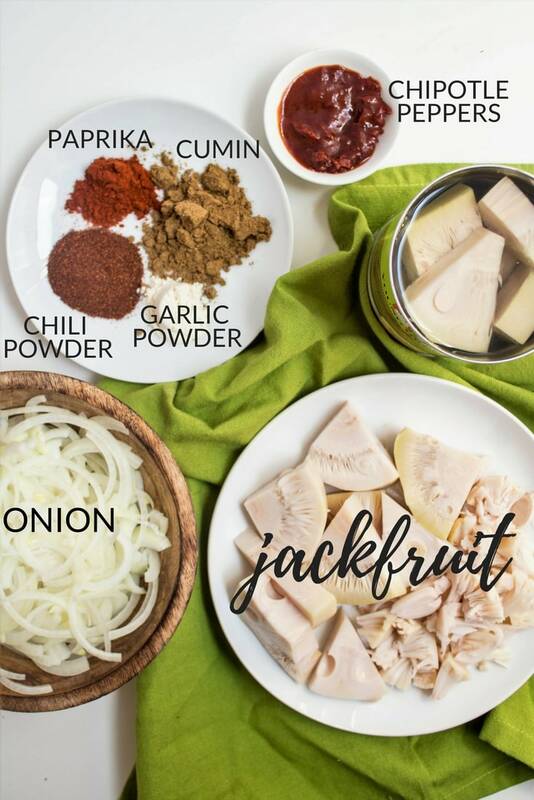 I LOVE cooking with Jackfruit and do it quite a lot! So much ao, that I started a company (potentially a Food Truck) called “You Don’t Know Jack”. Ha – amazing company name!! Oh my goodness. Get your canned jackfruit at your nearest Asian Market. It is plentiful and cheap that way. I am really excited to try this. But my grocery store only have jackfruit frozen. The bag only shows using it in smoothies. Have you ever used it frozen for this recipe….or any “cooked” recipe? Thanks! I haven’t tried using frozen jackfruit, but I bet it would work just fine! I made this and it was sooooo good! Best jackfruit recipien I’ve tried so far (: I used 3 chilies in adobo. Thanks for sharing! Awesome, I’m so glad to hear that!